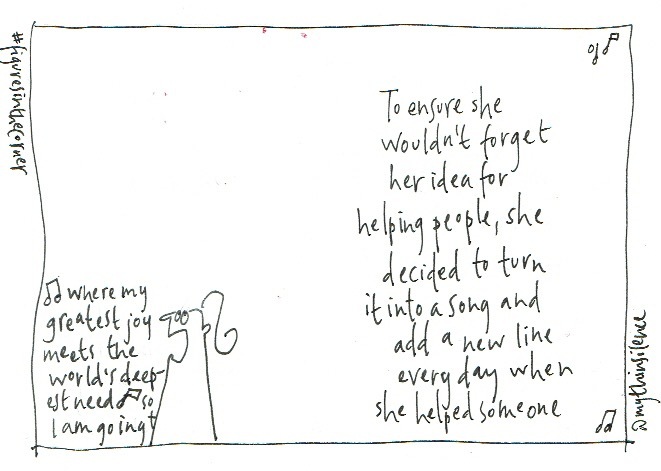 What if one way of defining happiness is being open to more, present to more, and realising more? If you were then to identify your happiest time in life, would this be some point in the past? Or right now? And, depending on your answer, is the future positive or negative for you? It has been said that we are not so much concerned with the meaning of life, but wanting to know if we’re alive. In the West we’ve developed stable and less risky environments, but these appear to have come at some cost. Stability becomes a disadvantage when leaves us wondering if we’re alive. The first quote, above, is Frans Johansson’s auditing of the way people are willing to take more risks when the degree of safety goes up – like pushing cars harder when we know ABS is fitted. There appears to be something about being human that needs to risk. The second quote comes from Peter Senge, and makes a lot of sense for the individual as well as the organisation. 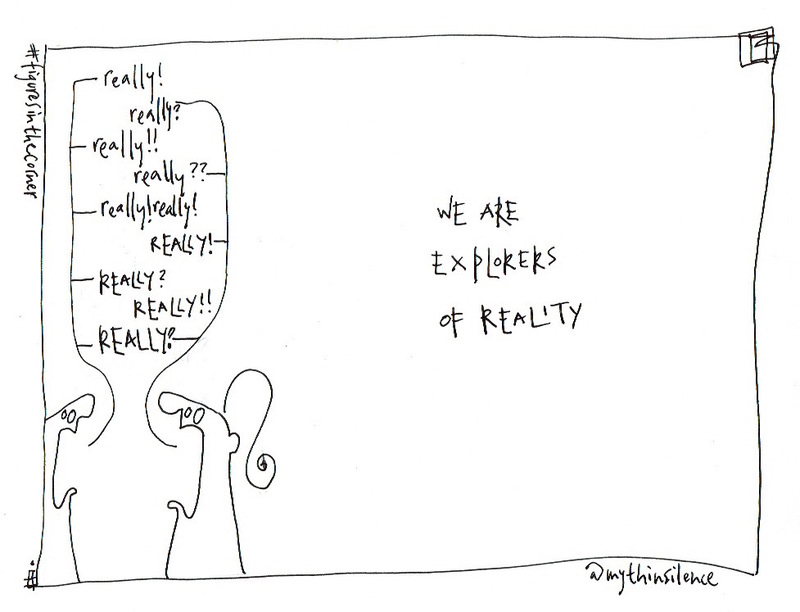 We’re asking questions about what is real, about the stories we tell ourselves, and are these the only way of understanding life in this world. We’re reworking our imaginations, dreaming more, opening up possibilities, exploring reality, and risking from a strong place within – integrity leading to wholeness, wholeness leading to perseverance, perseverance leading to integrity – the cycle of the revolutionary life. What is the song you sing deep within? Where does the journey of the song take you? What’s the refrain you repeat to ensure you never lose the purpose of your song? How does it differ to the songs of others (twelve notes, yet so many possibilities)? When and where does it complement the songs others around you sing? Who are the people with whom you share “choir moments” and make something bigger happen? Notice it, feel it, sing it. Once you begin singing, you never know where the song will lead you. There’s nothing new under the sun. 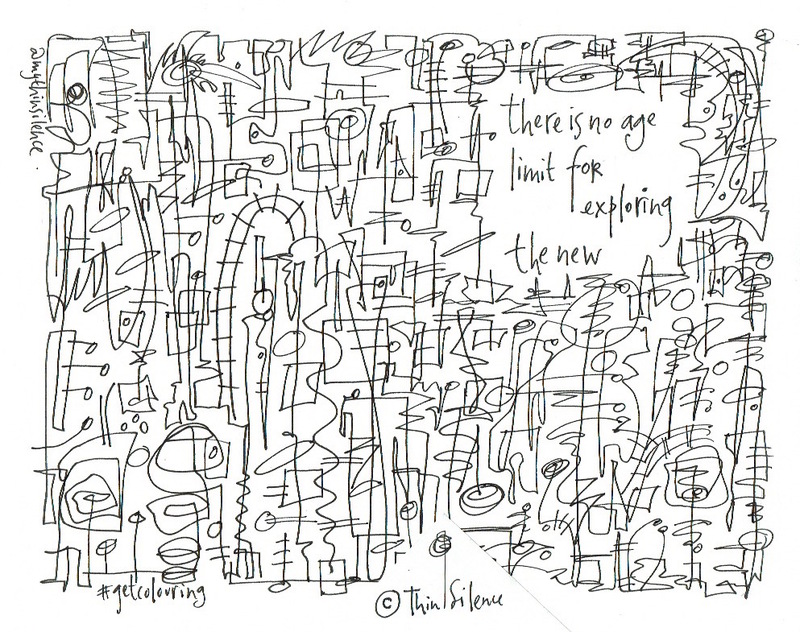 No-one has yet figure out how to do ex nihilo work; everything new begins with things that already exists. And yet, we come up with some astonishingly amazing things, so much so that we properly wonder when we’ll reach the limits of human innovation and creativity. When we’re prepared to leave behind the predictable and the familiar, the truth of this becomes more and more apparent. 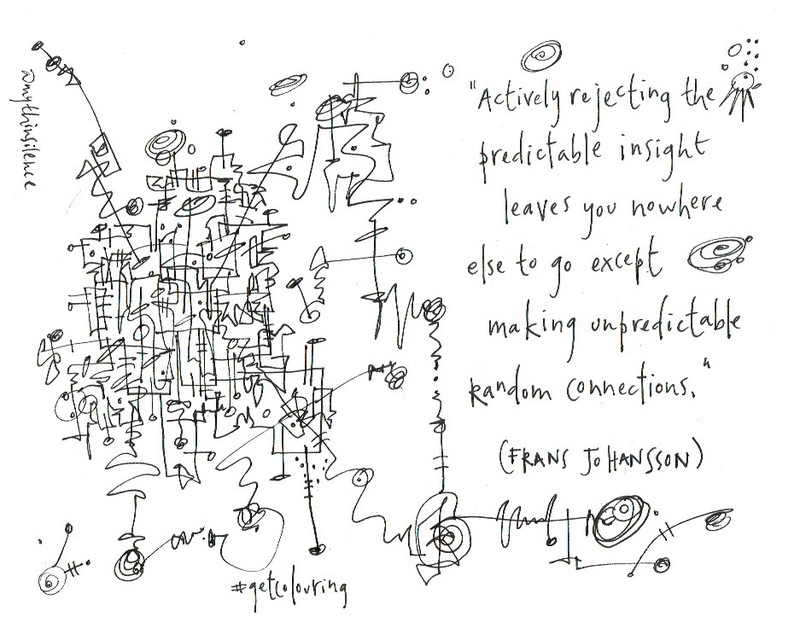 The unpredictable is mind-blowing, but not impossible – new ideas, imaginative ways of relating and working with people, different ways of behaving. Best of all, the things we need to guide us are already within us. Our openness is critically important. Staying open takes huge amounts of energy. It’s why the easier option is to do what everyone else is doing, participate in the groups everyone else is in, and reiterate the predictable ideas. What e’re about is bypassing the divergent, avoiding the emergent, and going straight to what we predict to be the convergent. So, what do I love in all of this? 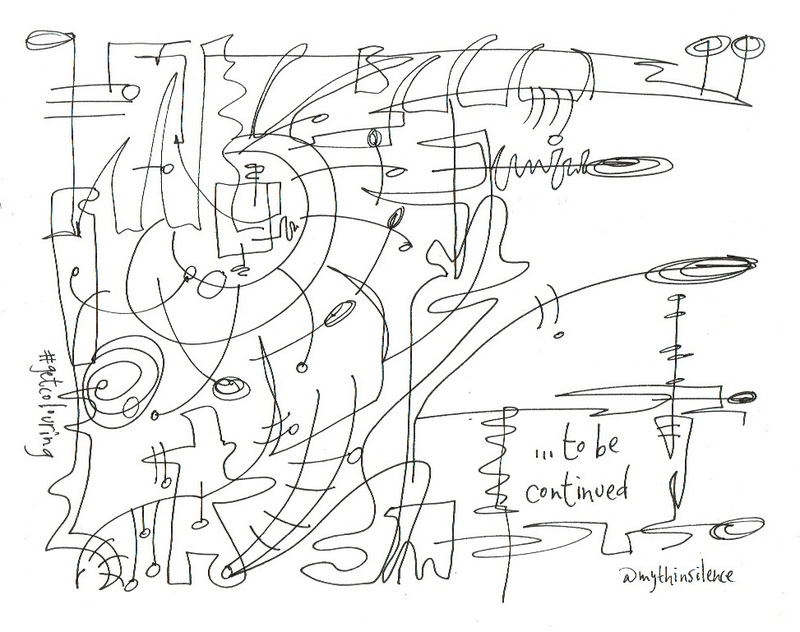 In my work with people exploring their passions, talents, and experiences, it’s coming upon their unpredictable paths. Who hear the cries of silence? Walter Brueggemann makes a curious remark when he proffers, ‘Prophecy cannot be separated very long from doxology, or it will either wither or become ideology.’^* Which I take to mean, those who hear the cries of silence must translate their openness and presence to what can be turned into a song they sing each day, ever new and ever alive, moving them deeper into the mystery. Life on earth can be really difficult at times, which is when we most need the most imaginative ways to bring hope and possibility. Human imagination is an amazing thing. We’re able to bring together thinking and ideas from all kinds of places, people, and times, and makes something utterly different. Collisions equal exposure to new thoughts and ideas.^ Off the peg just won’t make for a better future. New encounters and new experiences lead to new language which comes with: ‘the distinctive power, the capacity to speak in ways that evoke newness’^* Language is important because its the vehicle by which we move relationships and ideas forward. I’ll never reach the horizon; it always is out there, calling me. If I keep moving towards it, I’ll eventually return to where I began and know it differently – in a larger way. Though the aim is not to return, but to keep journeying: wherever I am, I can rotate 360 degrees and look upon a different horizon at any point. On a bad day: When there’s been nothing original in the work we’ve been doing for way too long. Like those flipping-frogs out of a Christmas cracker? Every year they’re in the crackers, and every year they’re less recognisable than the year before – and they don’t even flip. What if we could derive from the future instead of from the past. With imaginations provoked by what might be, we’d be able to create the present from the artefacts we’ve received from the past in new ways, without repeating. First of all, we need to get unfocused. Becoming too focused on something means we can miss the signals from the future. I’m grateful to Nassim Taleb who introduced me to the idea of the flaneur (female: flaneusse): literally an idler, and, more specifically, someone who has slowed down their life to be able to see more. 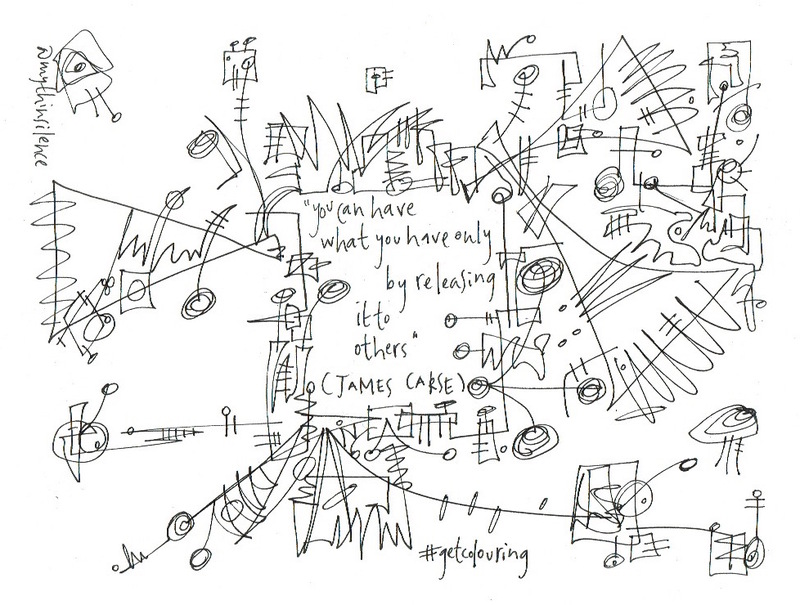 ** Doodling does this for me: from dawdling. I am able to slow down and wander down unfamiliar paths my reading introduces me to. The future opens more when we get off track – there are more means than there are people, and we begin looking together – more dreamt than derived. (^* Yesterday, I heard a politician talking about how refugees must be stopped coming to Europe, and especially to the UK. I wondered whether this person had met and listened to the story of a refugee. This morning I listened to an interview from someone from a military background heading up a refugee charity, his heart breaking, telling the stories of refugee’s, speaking of how we’re all humans. Sometimes I catch myself breathing tightly, usually because I’m concerned and anxious about something. I need to relax my breathing, to be aware of it filling my whole body, my whole life: rigidity is my enemy. Rigidity is not only about my breathing, but also the way I see and understand things. What do I do when I become the obstacle to who I want to be and what I want to do? 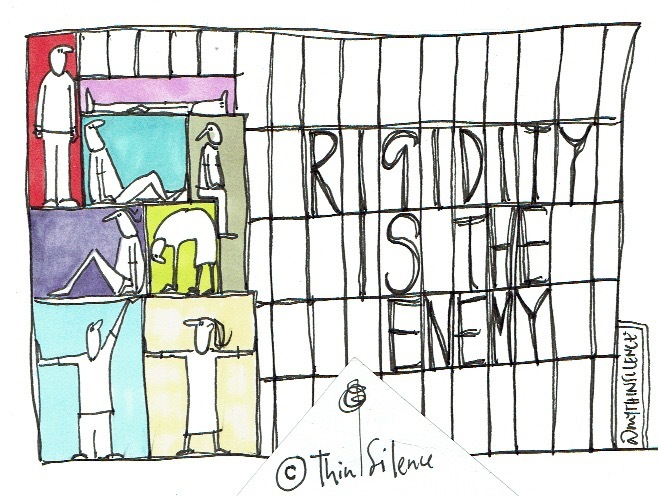 Rigidity makes me my own worst enemy. When I relax, though, I hear the thin|silence, sometimes coming from without, sometimes from within – a greater reality, a more generous possibility. It is in the thin|silence – where I am most open-minded, open-hearted, and open-willed – that I find myself most hopeful. When I am closed – another word for rigid? – the problem is yours, or the system’s, but not mine. I am the system, though; I am the obstacle. When I deal with my rigidity, I find myself able to pursue my dream and do all that change stuff with my circumstances to accommodate it.